These are not your mother’s pasta fazool. But true to the peasant origins of the traditional Italian dish, they both use seasonal ingredients along with pantry staples. Just what we need as the earth reawakens in April, and spinach and spring onions are found in the market or garden. I made two version of this during the week, both with snowcap beans, a flavorful two-color cannellini, organic whole wheat pasta, and a dollop of ricotta cheese. Traditionally, pasta e fagioli would be made with short stubby pasta, but since I was creating long stands of zucchini, spaghetti felt like the better option. 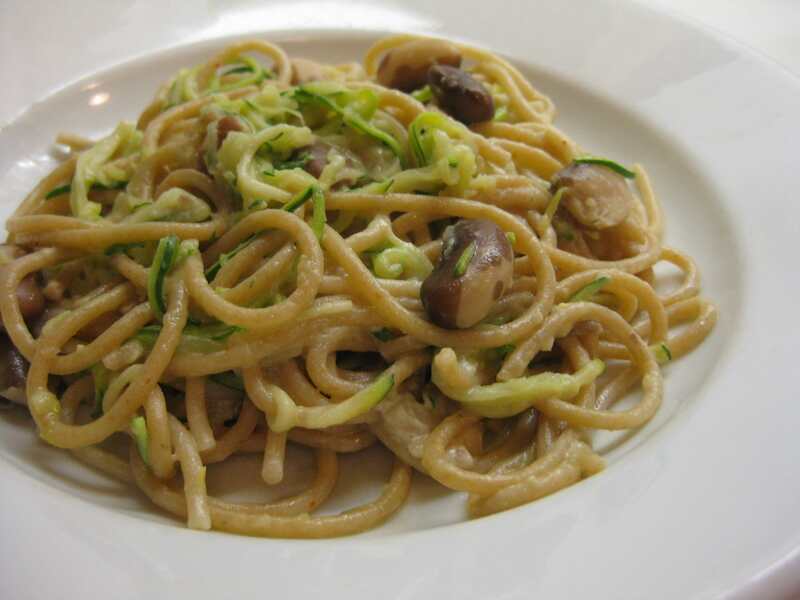 The first one combined strands of green zucchini and lemon zest, and was overtly the more flavorful of the two. 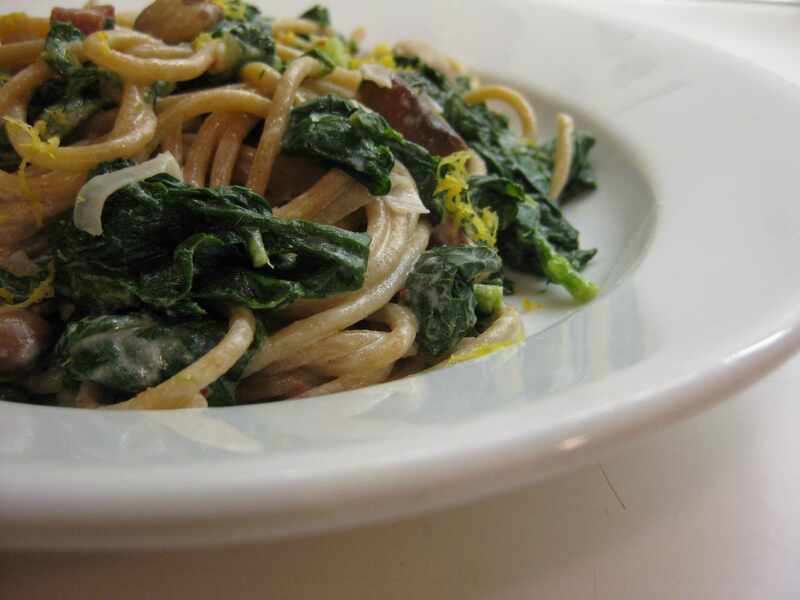 The second was made with sliced spring onions sautéed lightly in butter and spinach. Wash spinach leaves well, shake out excess water and wilt them in the water that clings to the leaves. Again wring out the excess water and chop the spinach into ribbons to add to the pasta. I added a little lemon zest and a lot of cracked black pepper to the spinach version to spark it up a bit. One trick with whole wheat pasta, which has a tendency to resemble shredded cardboard, is to cook it thoroughly and, as soon as it’s drained, sprinkle it with a little salt and olive oil. I never feel the need to do with whole grains, so I’m guessing it’s because of the character of the pasta. For both of these dishes, I reserved a little pasta cooking water to moisten the mixture, though I used only a few teaspoons. Since dried beans take a while to cook, I typically make extra whenever I’m cooking them. As I wrote a few days ago, these are large meaty beans that are as delicious by themselves as in combination with other ingredients. You can also freeze them so that they can be on hand pretty quickly. Alternatively, you could use good quality canned beans; I’m skeptical about the amount of salt and preservatives (usually for color) but they’re fine in a pinch.